The Ploughing Match Committee have produced a video with support from the Heritage Lottery Fund and various other funding bodies. The video gives a fascinating insight into this unique event - past, present and future and is available to buy now, along with other souvenirs. The video gives a wonderful opportunity to experience the ploughing match first hand, and in addition uses archive material, including photographs and film to give an intriguing insight into the history of the spectacle. All money raised is used by the Committee to promote and perpetuate the Boys Ploughing Match. The video is available in two formats (PAL and NTSC). If you are in any doubt as to which format you should order please contact your local video retailer for advice. Running time is approximately 40 mins. The video costs £10 plus postage (please see below). Unfortunately we can currently only accept payment in GB pounds - by cheque, postal order or banker's draft. 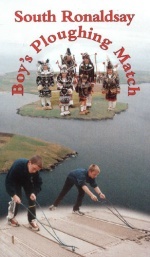 Please make cheques payable to : South Ronaldsay Boys Ploughing Match. International customers can email for advice on payment methods. Moira Budge (Video Co-ordinator), Ashby, Grimness, South Ronaldsay, Orkney KW17 2TQ, UK. We also have the following souvenirs available: Coasters £1.50, Key rings £1.30, Fridge magnets £1.50, Bookmarks £1.00, Single page calendars £1.50, Full colour calendars £3.50 and Mouse mats £4.50. All feature photographs from the Ploguhing Match or Festival of the Horse. If you would like to order any of these, please get in touch. If you have any queries please E-MAIL or write to: Moira Budge, Ashby, Grimness, South Ronaldsay, Orkney KW17 2TQ, UK.